FBN’s Neil Cavuto on Attorney General Eric Holder’s efforts to dismiss the debate over the Obama Administration’s reluctance to say ‘Islamic extremist’ by blaming Fox. "We spend more time, more time, talking about &apos;what do you call it,&apos; as opposed to &apos;what do you do about it.&apos; You know? I mean really... If Fox didn&apos;t talk about this, they&apos;d have nothing else to talk about,” Holder said. Trust me, Attorney General, we have plenty else to talk about. And we don&apos;t have to go further than your office when we do. First on the "Islamic Extremist" thing. It&apos;s not just a FOX thing. It&apos;s a growing bi-partisan thing. CNN devotes a lot of time to the administration&apos;s reluctance to say those words. And so, too, have many Democrats we&apos;ve had on Cavuto, some who served in your own administration. And others in Congress, too, who worry you&apos;re risking more violence not using those words. Democrats like Hawaii Rep. Tulsi Gabbard, a decorated veteran herself, who can&apos;t understand why a president she otherwise supports, can&apos;t wake up on this issue and fast. That&apos;s hardly our only fixation. But your fixation with Fox seems to be a pretty big fixation. Particularly, Fox reporters. I could talk about your office targeting journalists doing their job, and your lame apology insisting you were just doing yours. I could mention how your office didn&apos;t just target reporters. You also ignored looking into how the IRS targeted conservative groups...whatever came of that investigation? Or Fast and Furious? And your promise to get to the bottom of illegals ending up with U.S. provided guns? Or how you big-footed your way into Ferguson, because you didn&apos;t like a grand jury decision there. But quietly dropped the federal probe you knew wasn&apos;t going anywhere. Or how you did the same in New York, when riots started there. But nothing since. Or how you went after banks with huge fines for causing the housing crisis, but completely ignored Fannie Mae (FNMA) and Freddie Mac (FMCC), which everyone knows were at the core of that crisis. 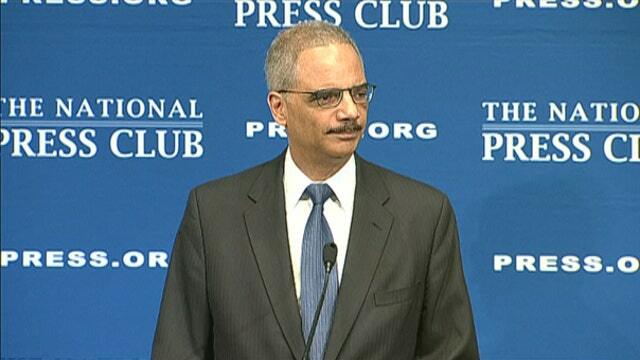 No, Fox isn&apos;t the problem, Mr. Holder. You are. We didn&apos;t create these crises, you did. We didn&apos;t target reporters, you did. We didn&apos;t cause racial riots, you fanned them. We didn&apos;t say "kill cops," you were the one who said nothing when rioters did say, "kill cops." I remember. All of it. Everyone was talking about it. What you chose to talk about, and what you chose "not" to talk about. Now you and your boss are pretty good at always saying Fox is the problem. But after a while, don&apos;t you see that you&apos;re the problem. We didn&apos;t sign the executive orders that stretched the Constitution to its limits. Your boss did. And by looking the other way and letting him, you did. So quit looking at us.